We are rounding the corner to the end of 2017. For many small businesses, the holiday season can make or break their profit margin for the whole year. Let that sink in a second, take a deep breath, and get ready to be inspired. 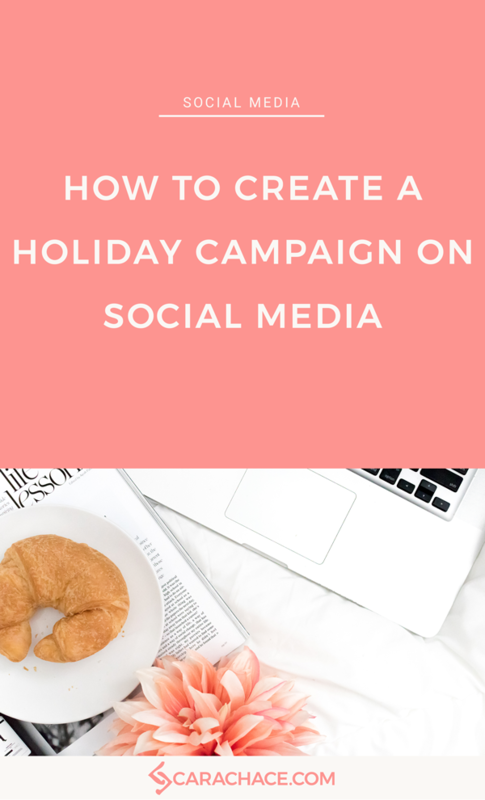 If you own a brand or business, chances are you can benefit from having a holiday campaign. This can be sales, specials, contests - really anything to celebrate the season with your customers. The key here is leaving out the transactional "Buy Now!" verbiage, and instead focusing on connecting with your customer via storytelling, your vision, and how you can solve their problem. Just like your normal business branding, being cohesive with a holiday campaign is essential to creating brand awareness and looking professional. If you missed the free training last week *sad face* - here are some great essentials for how to plan ahead for the holidays on social media. Think of a unique hashtag that can be attributed to your business for a holiday campaign. Try to keep it short due to Twitter’s character limit. The hashtag can relate to your brand or products. The hashtag will be how you track fans that are engaging with your campaign and make it easy for them to share! Lookup the hashtag on Instagram and Twitter to make sure it isn’t being used already. Use the hashtag on Twitter, Instagram, Facebook (sparingly), graphics, your website, and in-store. Make sure you check for conversations using your hashtag and other complimentary hashtags to engage with potential customers. 2)Come up with a social media campaign idea. Easier said than done, I know. But remember - a campaign is around something special you want to promote - not your normal social media content. Example: Ask for fans to post a picture of them using your product as part of a contest. Example: Create a behind-the-scenes story about your business (video or Instagram Stories, etc.) and give clues every day that lead to a grand prize. 3)Decide which social media network this campaign will live on. Any posts relating to the campaign should direct fans to this platform. It's ok to cross-promote, but you want to be clear with fans where this campaign is "hosted". Use a high-quality image that is either yours, or free from a stock photo site (Pexels and Unsplash are my fave). Create several graphics in sizes specific to each social media platform. Attached is an easy guide to each platform. Make sure you don’t miss Jon Loomer’s super comprehensive Facebook Images size guide. Canva and Pablo by Buffer make this process even easier. Add verbiage, your hashtag, logo, etc. to the graphic. Use these throughout your campaign so your content is consistent and recognizable. Consider changing your platform header images to your holiday campaign. 5)Schedule out your social media posts. Don't post a couple times and forget to keep going - consistency will keep your campaign top-of-mind. Whether you schedule right within Facebook, or use a scheduling app like Buffer or Tailwind*, take the pressure off and have it all planned out so you can have fun and look for opportunities to engage with your fans. Holiday campaigns that start too early can get stale and annoying. If your fans/followers start to engage less and less, your posts will show up less and less in channel algorithms. Plan how your content revolves around the campaign week to week, and month to month (if starting early). Don’t post the same messaging/images in November as in December. Now is the time to tap into the “Why” of your business – what sets you apart from competitors and the vision behind your brand. Join the free rockstar membership in pinterest powerup. *I am an affiliate for Tailwind - which means if you sign up through my link, I'll get a small commission. I hope it goes without saying that I would never, ever refer you to something I don't love and have used. In fact, I couldn't do my business without Tailwind, so yeah - it's awesome. Is There More Power In Feeling Or Picturing Your Goals?